Tarifa is the wind capital city of Europe. Thanks to the perfect conditions and the unique flair of this place, Tarifa attracts the cracks of the windsurf scene for more than a decade yet. In the early 80ies the windsurfers have discovered Tarifa and initiated the first touristic boom of this little town and its surroundings. Several world cup events took place here, for example the PBA Windsurfing Speed Worldcup. Besides a lot of action on the water, Tarifa offers amazing nightlife. In many of the bars in town windsurfing is the topic #1 and you might even get to meet some famous windsurfering stars from the worldcup circus, who like to come for training. Need to rent an accommodation for your windsurfing holidays? Here you can find ideal accommodation for your windsurfing holidays in Tarifa. One of the two winds will certainly be blowing most of the days of the year. Strength in beaufort 5-8 Bft . Strength in beaufort 3-6 Bft. The most comfortable solution for windsurf holidays in Tarifa is to book one of the offered holiday apartments right at the spot. 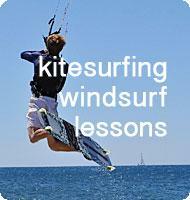 Please check our best offers for windsurfing rentals in Tarifa, Spain. In autumn, winter and spring we recommend the Playa Chica beach for great windsurfing with strong Levante. This beach is the only beach on the Mediterranean side of Tarifa, between the port and the Isla La Paloma. Levante enters here with full power and brings some larger waves as well. Between June and September it is forbidden to windsurf here, because the beach is reserved for swimmers. The police charges fines in these months if they see you windsurfing there. The Beach Playa Los Lances extends from Isla La Paloma til the Rio Jara, 3 kilometers out of town in direction dune. This is a good spot with Poniente blowing consistantly from the west and producing fun waves with about 5 Bft. winds. With Levante it is not the best to go windsurfing. The buildings of Tarifa town create unpleasant wind shades making windsurfing quite uncomfortable. This beach is separated in a windsurf zone, a kitesurf zone and a school zone. It begins at the river Rio Jara and continues until the Hotel Dos Mares, connected by a huge parking lot with plenty of space (3km) to park right by the beach. The windsurf zone is marked with signs. The water is absolutely flat here and the Levante is a bit weaker than in Valdevaqueros (near the large sand dune). Except for high season, this beach is never crowded and great for improving your skills. The city beach Playa Valdevaqueros is not recommendable for Levante days, as there's wind holes created by the hosues of town. The other end of the bay, the Valdevaqueros, is certainly the better choice for those days. It's easy to find, just dirve from Tarifa in direction Cadiz and look out for the sand dune at the bottom of the mountain of San Bartolo. This is where the most windsurfer can be seen. There is a windsurf zone and a kitesurf zone to handle the amount of people in the water. The shape of the bay provides that the Levante reaches its strongest force at this spot. Further outside the Levante creates great waves for jumping. On days with too much wind in Valdevaqueros, we recommend to drive to the next bay named Bolonia. Usually the wind looses 1-2 Bft. until it reaches Bolonia. Kitesurfing is not allowed in Bolonia beach. A German windsurfing center has opened in Bolonia in 2006 offering quailfied lessons and rental equipment. "Tarifa enjoys more than 300 days per year with more than 4 Bft.!"